HP ePrint technology lets you print from virtually anywhere. Print seamlessly from your iPad®, iPhone® or iPod touch® (not included). Superfast printing - 28 papers per minute black; 23 color (ISO standard). Automatic 2-sided printing helps save paper and money. Print lab-quality photos with just a touch. Includes an 80-sheet paper tray for your larger print/copy jobs. Letter - 8.50" x 11"; Executive - 7.24" x 10.51"; 4" x 6"; 5" x 7"; A4 - 8.30" x 11.70"; A5 - 5.83" x 8.27"; B5 - 6.90" x 9.80"; B5 (JIS) - 7.20" x 10.10"; A6 - 4.10" x 5.80"; 3.90" x 5.90"; 3.50" x 5"; 5.10" x 7.10"; 2L - 5" x 7.01"; 8" x 10"; Ofuku Hagaki - 7.87" x 5.83"; Monarch Envelope - 3.90" x 7.50"; 4.40" x 6"
Get a sleek design and versatility for premium printing in any room. Print lab-quality photos and everyday documents from virtually anywhere,2 scan to email,3 make quick copies, access web content,4 and charge your iPhone®. Innovative design you'll be proud to show off. With a cutting-edge look, sleek space-saving features, whisper-quiet acoustics, and an easy-access USB port optimized for iPhone® charging, this e-all-in-one redefines what a printer can be. Expand at-home printing—easily print lab-quality photos, make color copies, and scan photos and documents to your email,3 using the intuitive touchscreen. The see-through lid helps ensure perfect placement on the scanning bed. Conserve energy and save paper with a low halogen printer9.The HP ENVY120 e-All-in-One is ENERGY STAR® qualified, with automatic two-sided printing and convenient cartridge recycling10 to help you lower your environmental impact. Borderless photos are printed right to the edge of the paper. You get beautiful photo prints with no trimming! HP wireless direct is a new feature that allows your Wi-Fi capable devices (for example: smart phones, tablets, or computers) to make a wireless network connection directly to your printer without using a wireless router or access point. 1 Either after first page or after first set of ISO test pages. For details see http://www.hp.com/go/printerclaims. 2 Requires an Internet connection to the printer. Feature works with any connected Internet- and email-capable device. Requires HP Web Services Account Registration. Print times may vary. Some HP LaserJets may require a firmware upgrade. For a list of supported documents, and image types, see www.hp.com/go/eprintcenter. And for additional solutions, see www.hp.com/go/mobile-printing-solutions. 3 Compatible with most popular email services. Check www.hp.com/go/eprintcenter for more information. 4 Requires a wireless access point and an Internet connection to the printer. Services require registration. App availability varies by country, language, and agreements. For details, www.hp.com/go/eprintcenter. 5 Wireless performance is dependent upon physical environment and distance from access point. 6 Supports the following devices running iOS 4.2 or later: iPad®, iPad® 2, iPhone® (3GS or later), iPod touch® (3rd generation or later). 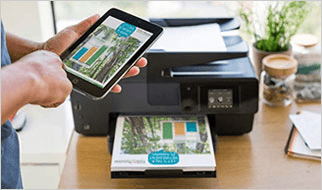 Works with HP’s AirPrint™-enabled printers and requires the printer be connected to the same network as your iOS device. Wireless performance is dependent upon physical environment and distance from the access point. AirPrint, the AirPrint Logo, iPad, iPhone, and iPod touch are trademarks of Apple® Inc., registered in the U.S. and other countries. 7 Google™ and Gmail™ are trademarks of Google Inc. Feature requires Google Cloud Print™ ready printer or existing printer connected to a PC with Internet access. Print times may vary. Currently only Google apps are supported. 8 HP Auto Wireless Connect may not be available for all system configurations. Wireless performance is dependent upon physical environment and distance from access point. For information on compatibility, visit www.hp.com/go/autowirelessconnect. 10 Program availability varies. Original HP cartridge return and recycling is currently available in 47 countries, territories, and regions in Asia, Europe, and North and South America through the HP Planet Partners program. For more information, visit www.hp.com/recycle. 11 Power requirements are based on the country/region where the printer is sold. Do not convert operating voltages. This will damage the printer and void the product warranty.